For the first time ever, the number of broadband subscribers at top pay TV firms surpassed the number of pay TV subscribers according to data from Leichtman Research Group. You see, the Comcast and Time Warner Cable merger is really about broadband. The data shows that the difference in subscribers is slight — there were about 49,915,000 broadband subscribers at the end of the second quarter of 2014, compared to about 49,910,000 cable TV subscribers. Most consumers in the U.S. get their broadband from a cable provider, with 59 percent of the broadband subscriptions provided by a cable company — a trend that has been consistent for years. 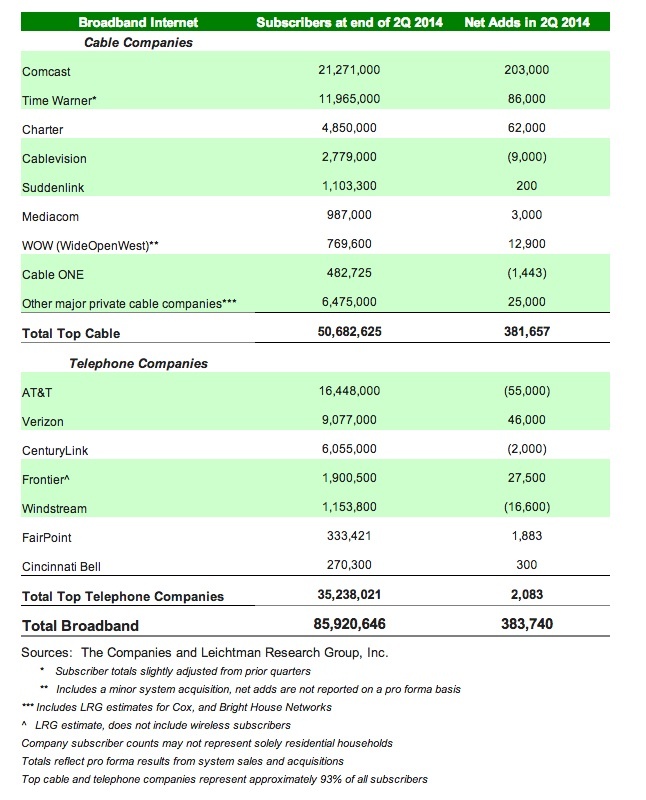 Overall, there were 383,740 new broadband subscribers during the quarter, with the lion’s share of those additions going to cable companies (telcos added a net of 2,083 subscriptions). This isn’t surprising, but as the FCC and the Department of Justice review the merger between the top two cable providers, it’s worth noting that while [company]Comcast[/company] may argue about the benefits the deal poses to pay TV consumers, the regulatory focus needs to be on how this deal will change the level of competition in broadband. Because clearly, the consolidation is tilting toward cable providers and those cable providers are doing a lot more than merely focusing on pay TV.